• New industrial / distribution units. 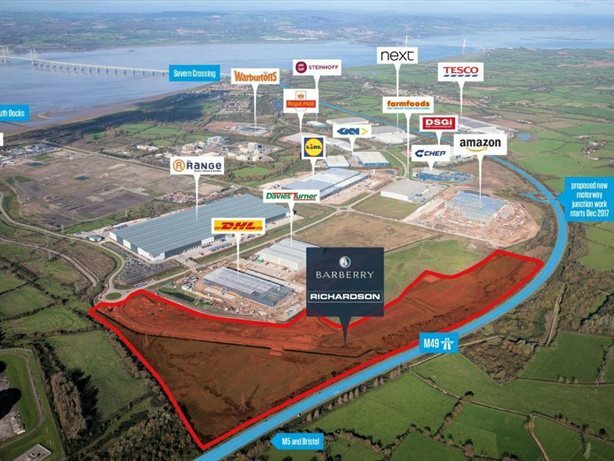 • The prime Bristol and South West logistics location. permitting immediate start to development on site. • On site with construction of access roads. scheme to commence April 2018. • Highly prominent site adjacent to M49 motorway. construction works commenced in December 2017. Aerospace, Warburtons and Chep UK. South West's premier logistics location. 0.5 miles from the new J1 of the M49 (due to complete in 2019) and 3.4 miles to J18 of the M5, providing access to the national motorway network via the M4/M5 intersection. Units are available by way of a new Full Repairing and Insuring lease on terms to be agreed, or alternatively by way of a sale of a freehold interests with vacant possession. The managing agent for this property will be happy to give you any more information you might need or to arrange a viewing.